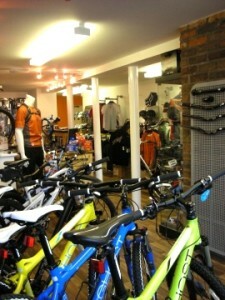 The Blazing Bikes shop is based at the Shropshire Hills Mountain Bike and Outdoor Pursuit Centre. The shop and workshop is open for business from 9am to 5pm Monday to Friday and from 8am to 5pm at weekends. They can cater from a simple job such as replacing a worn gear cable to a full service, from truing a buckled wheel to replacing a bottom bracket. Blazing Bikes pride themselves on high customer service, a high level of workmanship and only stocking quality items in the shop. Their shop has a large range of equipment and clothing. There is also a campsite and camping pods at the centre. The camping pods are fully heated and can accommodate up to 6 people. There is a shower block, bike wash station and a pub onsite. Blazing Bikes also offer guiding and coaching. All our instructors are fully qualified, hold a first aid certificate and are experienced mountain bikers. Hire bikes available too. 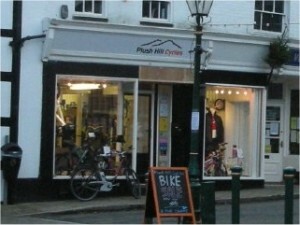 Plush Hill Cycles is a small cycle shop found on the square in Church Stretton, a small shop that is big on service. They are very keen to promote cycling in the Strettons. 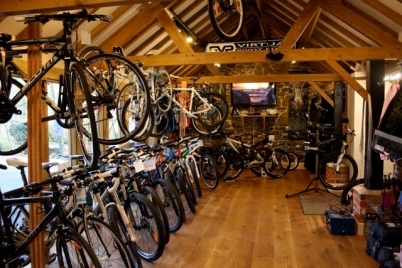 We specialise in mountain bikes and riding the Long Mynd but are here to help with all your cycling requirements so pop in for a brew and a chat, advice is free. We have a fully equipped workshop and carry out all types of servicing and repairs.